Interviews are an important part of life, from our first job interview to the all-important interview that proves us worthy of buying a dealership’s decade-old Infiniti G37 coupe for $19,000. Wait, what? The discontinued G37 coupe is, and has been for years, a good car choice. It pumps more than 300 horsepower from its V6 engine, can come with three pedals, sounds great, isn’t too expensive, and its looks have held up decently. 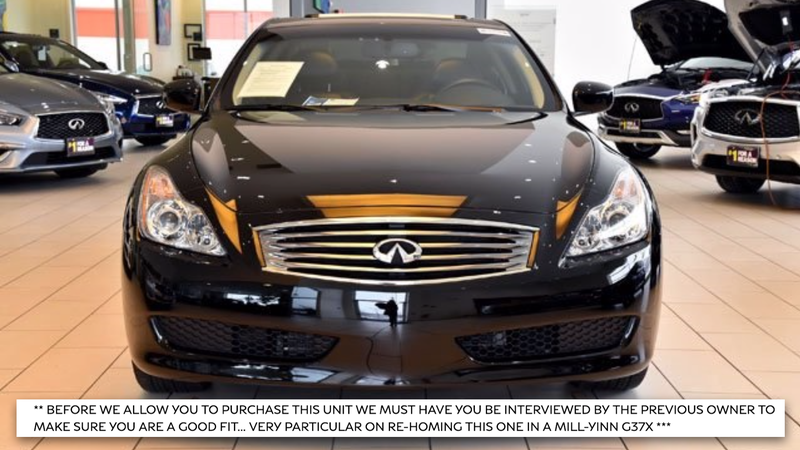 But buying a used, 9,273-mile 2009 Infiniti G37x from Infiniti of Naperville in Illinois isn’t about your choice in the matter—it’s about whether you’re chosen to buy it. No, this isn’t Hogwarts or anything. There’s no magical sorting hat determining potential buyers’ worthiness. The dealer selling the car is, however, requiring anyone who wants to buy it to do an interview with its former owner. YOUR EYE’S DO NOT DECIEVE YOU ... THE MILES ARE ACCURATE ... ONE OWNER ... PREVIOUS OWNER IS A CAR ENTHUSIAST ** BEFORE WE ALLOW YOU TO PURCHASE THIS UNIT WE MUST HAVE YOU BE INTERVIEWED BY THE PREVIOUS OWNER TO MAKE SURE YOU ARE A GOOD FIT... VERY PARTICULAR ON RE-HOMING THIS ONE IN A MILL-YINN G37X *** PASSED OUR RIGOROUS 228-POINT INSPECTION!! In addition to the interview, this low-mileage, ultra-clean 2009 G37x comes with a seven-speed automatic transmission and all-wheel drive, which is what the “x” in its name stands for. The G37x model didn’t come with the manual option, as Infiniti noted when it came out, but other G37 models did. So, a dealer, selling a 2009 Infiniti for less than $20,000, is requiring interested parties to do an interview with the previous—keyword, “previous”—owner in order to make sure they’re “a good fit” for “re-homing” this vehicle. This isn’t a multi-million-dollar rare supercar. It’s not a living, breathing pet that needs a safe new home. It’s a 10-year-old Infiniti. The listing made no mention of whether or not interested buyers would need to bring a resume along with them, or what that resume should entail. But, as with any other interview in life, stick to the basics: Your weaknesses are actually your strengths, and any conflict you’ve ever had was, at the end of the day, actually your coworker (or car)’s fault. Thanks for the tip, ThatWhiteRabbit!